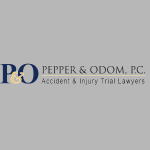 At Pepper & Odom, P.C. we handle dog bite cases and have a proven record of success. Did you know that approximately 4.5 million dog bites occur in the United States every year? (See www.caninejournal.com). Did you know that approximately 900,000 of those dog bites become infected? (See www.caninejournal.com). People, especially young children, can be injured in a blink of an eye. Eighty percent (80%) of the dog bites cause no injury that requires medical attention. (See www.caninejournal.com). However, of those twenty percent (20%), they are really severe and require medical attention. From my own personal experience, in dealing with dog bite cases as a former district Attorney and as a Personal Injury Attorney, I have seen children have their eyes torn out by a biting dog, half their faces ripped off, injury to their head, fingers and hands greatly injured, and bodily injuries to their torso, arms, and legs. All of these incidents required medical attention and some required plastic surgery as well. The top dogs that bite are: Chihuahua, Bulldog, Pit Bull, German Shepherd, Australian Shepherd, Lhaso Apso, Jack Russell Terrier, Cocker Spaniel, Bull Terrier, Pekingese, and Papillion. (See www.caninejournal.com). Pit Bulls account for the vast majority of bites. Dogs are products of their environment, while all dogs can bite, their training and environment are really the cause of their aggressive behavior. (See www.caninejournal.com).